What do you get when you mix two animation juggernauts together - Pixar Animation Studios and Walt Disney Pictures? Awesome 3D animation, a clever premise, hilarious character lines and enough emotional triggers to leave you wanting more. The Inside Out movie is based on an intriguing concept – what happens inside your head? What if the emotions you feel have voices and are characters themselves? The film is based on an original idea by Pete Docter, the director of the movie along with co-director Ronnie del Carmen and is produced by Jonas Rivera. It's definitely an inventive idea playing on everyday themes we can relate to and sometimes have trouble understanding – human emotions. We crave for answers enough that many books are written about it and it is the subject of many psychology papers. Inside Out has a playful and cheeky take on the subject – everyone is guided by emotions living in the control centre of our minds. 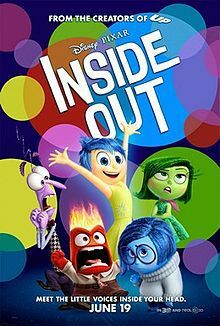 Inside Out is based on 11 year old Riley Anderson who has just been through a major experience in her young life – moving from the home she loves and understands to a new school, house and environment in San Francisco. Young kids in the audience may not understand this traumatic experience but older kids, teenagers and parents in the audience can definitely relate. And that is why this movie appeals to such a wide audience – younger kids are entertained by the cute and colourful characters whereas the real benefactors are their parents who understand the cleverness of the deeper themes in the movie. Riley and everyone else in the movie are guided by their emotions – Fear, Joy, Sadness, Anger and Disgust. These characters are voiced by Amy Poehler as Joy, Phyllis Smith as Sadness, Mindy Kaling as Disgust, Bill Hader as Fear and Lewis Black as Anger. Together, they inhabit a hidden world in our minds full of core memories (coloured balls filled with momentous moments in Riley's life), Imagination Land (a place where our imaginations run wild and which sadly slowly disappear as we grow older) and Dream Productions (where our dreams are staged). This hidden world is just so wondrous, colourful and bizarre that it can't possibly be true but somehow it explains things we have seen and experienced in life like our long term memories and personality traits. The story highlights the conflict between the various emotions in our lives as we watch Riley and her emotions struggle to adjust to a new life in San Francisco. Sadness and Joy accidentally get lost within the rest of Riley's mind and headquarters is in turmoil without Joy as they decide how to best navigate the situation, despite their main character traits shining through such as Fear's propensity to coward in the corner, Anger's abrupt manner and Disgust's sarcastic contempt of most things. However, the main theme of the story is about how Riley needed all the emotions equally to live a balanced life, despite the story starting out with Joy being the main peacekeeper. Fear kept her safe and Sadness assisted her with vulnerability and empathy, allowing her to display her emotions and pave the way to happiness. There were plenty of touching moments in the movie reminiscent of growing up with some memories forgotten - old friendships, Riley's imaginary friend and childhood memories. I could definitely relate to this, mourning my lost childhood and laughing at some of the differences between men and women as the movie dipped into her parent's minds. Overall, this is a smart and entertaining movie that will not only delight its audience big and small, it will give its adult viewers food for thought as they marvel at its subtle intelligence.